HomeNews & EventsAsk the experts about your future degree! Ask the experts about your future degree! 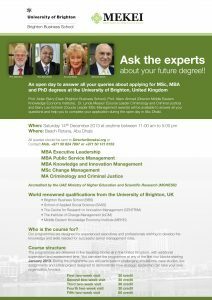 An open day to answer all your queries about applying for MSc, MBA and PhD degrees at the University of Brighton, UK. MBA programmes are delivered in five teaching blocks all in the United Kingdom, with additional supervision and assessment time. You can start the programme at any of the first four blocks starting mid January 2013. 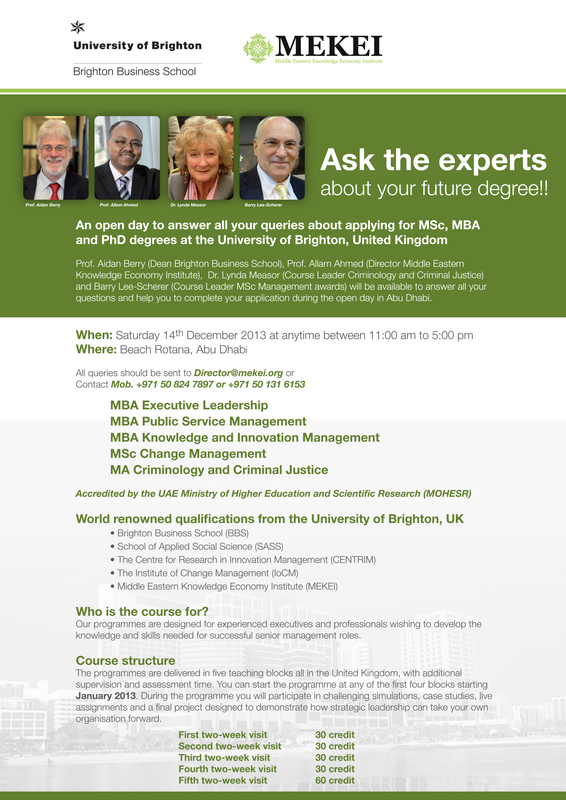 Professor Aidan Berry (Dean Brighton Business School); Professor Allam Ahmed (Director Middle Eastern Knowledge Economy Institute); Dr. Lynda Measor (Course Leader Criminology and Criminal Justice); and Barry Lee-Scherer (Course Leader MSc Management awards) will be available to answer all your questions and help you to complete your application during the open day in Abu Dhabi.